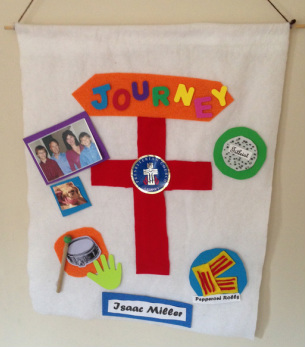 The photos shown above are examples of recent confirmation banners constructed by our eighth grade confirmation class. The youth of congregation, grades 9 through 12, meet each Sunday morning in the third floor senior high loft for their own Sunday School class. Christ-focused discussions are centered on living in today's society. These teens also meet throughout the year for fun and fellowship for events as a Cleveland Cavaliers game, a trip to the cornfield maze or an overnight lock-in at PPC. The youth also go on a mission trip each summer to help others in need and give back to the community. Confirmation classes begin in seventh grade during the Sunday School hour in the third floor junior high loft. This year is spent focusing on beliefs and how they apply to every day life using several different curriculum sources. These youth participate in community service projects throughout the year. The eighth grade class is held in room 39 every Sunday morning during the Sunday School hour. The year is spent focusing on the Presbyterian church as a whole while also honing in on the role of the Poland Presbyterian Church. The youth are paired up with a sponsor to help guide them through the process. Everyone is required to do a certain number of community service projects. The year is capped off by writing a statement of faith and constructing a Confirmation banner displaying each youth's gifts and faith. The eighth graders are welcomed into the church as new members on Confirmation Sunday which is held in the spring. Each spring Poland Presbyterian Church offers several scholarships to high school seniors who are confirmed members. The scholarships are presented during the Senior Sunday service. Please contact the church office at 330.757.1547 for more information.